PeiYuan Li | Mellon Medical B.V.
PeiYuan, VP Engineering of Mellon, is responsible for all product design, engineering and manufacturing related activities. His solid experience in Design for Manufacturing, Lean and Six Sigma, and successful on-time delivery of medical devices will contribute to the successful development of the Switch® and future Mellon products. 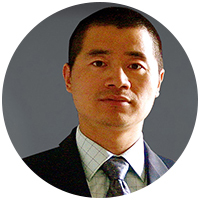 PeiYuan has a PhD in Mechanical Engineering and a MBA in general business management. He is also a certified Six-Sigma black belt. Previously, PeiYuan worked in Abbott Laboratories, and in Edwards Lifesciences in various departments and positions. He has extensive experiences in medical device product/process design, development and optimization, DFM, Lean and Six Sigma, product cost reduction, supplier management, and project management. PeiYuan is strong in execution, he has good track record in on-time delivery with successful results. PeiYuan has 17 patents in previous employment.